Imperial College London’s undergraduate prospectus was last redesigned in 2010 and since then had largely remained static in terms of design and content strategy with basic updates made each year. In 2013, following user research and internal review, the team proposed and delivered a complete rewrite and redesign, making radical changes to the content and format of the publication. 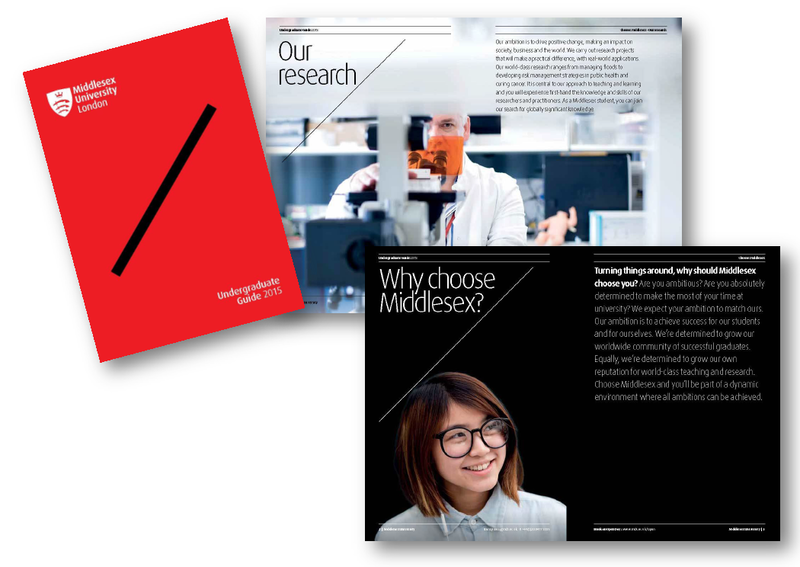 Middlesex University aimed to create a visually strong content and brand led prospectus that stood out primarily at recruitment fairs. 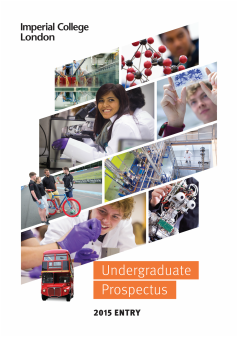 The approach to the prospectus was based on research that analysed the profile of current and aspirational undergraduate prospectives. Developed through workshops with current and prospective students, six ‘personas’ were used to develop a completely personalised approach to their UG campaign. The key developments in the 2015/16 Undergraduate Prospectus included the inclusion of the Times Higher Education University of the Year messages which Huddersfield won in 2013 and the integration of Huddersfield to be an ‘inspiring, innovative University of international renown’. ‘Reflections on an art school’ was a complete redesign and rewrite of what had been the GSA’s undergraduate magazine. It demonstrates the 5 year journey of moving from a traditional prospectus to a piece of print that reflects the school, taking the decision that the information was not of specific relevance to either UG or PG audiences, but rather both audiences. The development of the new Leeds College of Art prospectus was a re-design to develop a concept and template that could be used for 2-3 years with minimal changes to save resource. The publication moved from a prospectus, with all the information required, to a brochure which communicated the brand and purpose of Leeds College of Art. As part of its global strategic plan, Heriot-Watt University set ambitious targets to increase its share of the postgraduate student market during the 2014 recruitment cycle. A suite of printed postgraduate prospectuses were created to present postgraduate education from Heriot-Watt as delivering the ‘leading edge in the international world of work’. The University of Leicester set out to improve the way their prospectus conveyed Leicester’s academic credentials with a focus on high quality. This included upgrading the paper stock for high-end look and finish, added sections showcasing Leicester’s research, including individual staff profiles and added departmental ‘’blurbs’’ to highlight achievement and strengths. The 2015/16 Postgraduate Prospectus was an evolution of the 2014/15 prospectus which incorporated an innovative and engaging approach. The key aims were to tell the story of the University and the PG student experience through their staff. Huddersfield adopted a magazine style which utilised an interview/editorial approach, featuring both academic and support staff. 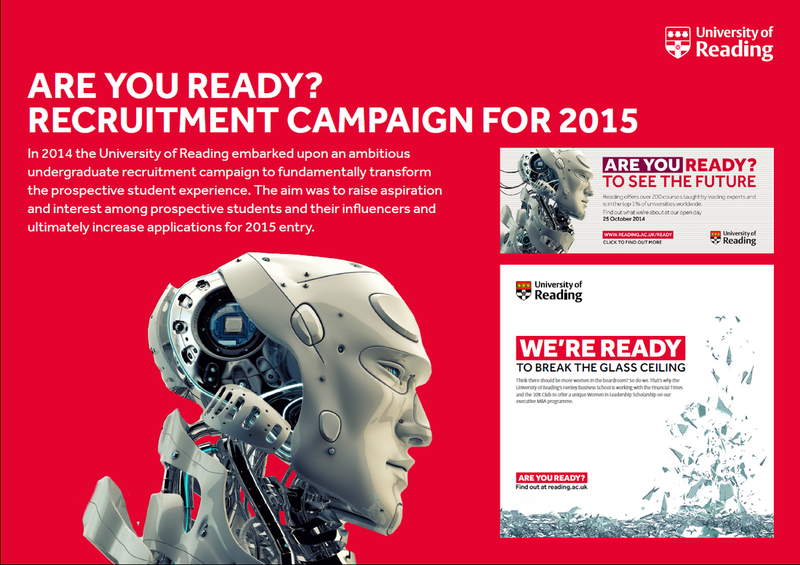 In 2014 the University of Reading embarked on an ambitious recruitment campaign to fundamentally transform the prospective student experience, from attracting initial interest from prospective students and converting their interest into confirmed registrations for Open Days. 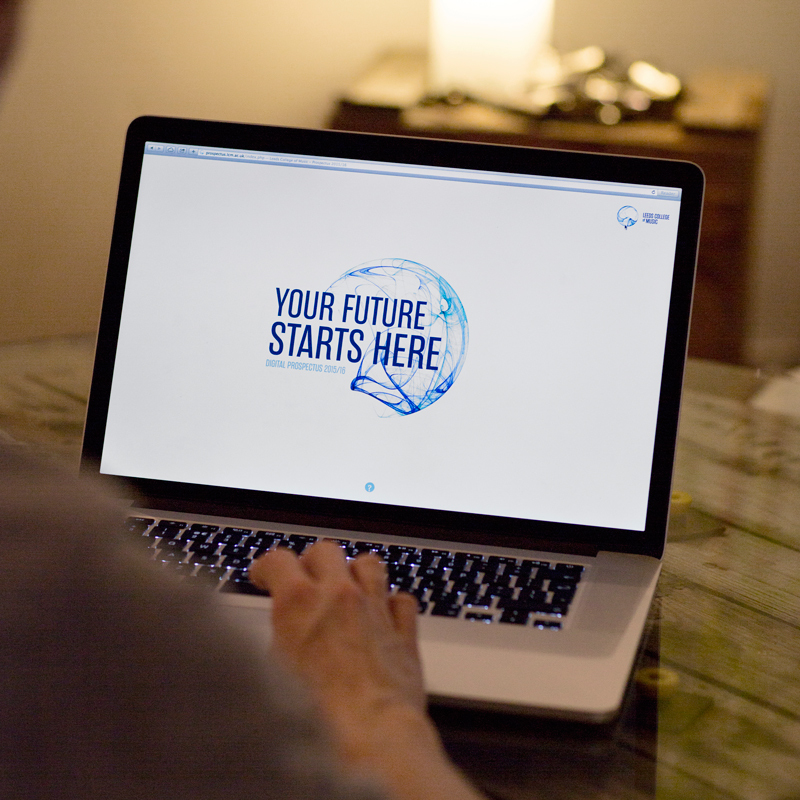 The ‘Ready’ campaign became the first external implementation of the new visual identity. During 2014, the University undertook a full review of attitudes and perceptions of Glasgow with a range of stakeholders and the resulting proposals saw Glasgow take bold new steps to further enhance their student recruitment marketing drive. This activity resulted in the creation of an overarching new brand essence: “Where people inspire people to change the world”, and the subsequent launch of their key recruitment message: “World Changers Welcome” (WCW). #IAMIN was an innovative social media and PR/communications led campaign designed to achieve cut-through with potential students. An engagement-led user-generated content online campaign with a focus on securing high quality students (ABB+), #IAMIN sought to address a gap in projected numbers but also aimed to harness a range of internal stakeholders to work together at a crucial time of year. This is the story of how NTU increased the number of students recruited from India during a period where the wider UK sector suffered a decline. The approach was about demonstrating to Indian students and their families at a personal level that the UK is a welcoming destination and a great investment for their child’s future. The Bradford Crocus Cancer Appeal, launched by the University of Bradford together with Yorkshire Cancer Research, the Bradford Telegraph & Argus Newspaper and the Sovereign Health Care Charitable Trust, aims to raise £1m for the purchase of a new mass spectrometer which will help in the University’s research. The creation of the Legacy Officer role in late 2013 recognised the urgent need to effectively steward the existing pool of 20 legacy pledgers and to pro-actively realise the opportunity to increase philanthropic income from legacies. A new legacy programme was therefore designed and implemented. The work of Salford Institute of Dementia was an informal collaboration between colleagues in Nursing and Design for three years before the Office of University Advancement identified it as a project with real fundraising potential. Best Games Ever – We did Glasgow proud! A month of events to celebrate the University of Groningen turning 400 years old in 2014 which aimed to bring 100,000 visitors to the city. The celebrations were aimed at students, employees and their children, students of the future, alumni, citizens, partners of the University and the general public. The anniversary was branded as RUG400 by combining the number ‘4’ and the mathematical symbol for infinity ‘∞’ to be pronounced as ‘For Infinity’. Loughborough’s Research Excellence Framework campaign used the results of the assessment as a springboard to reinforce their position as one of the country’s leading research universities. The ultimate aim of this activity was to increase the number of Open University MBA students. 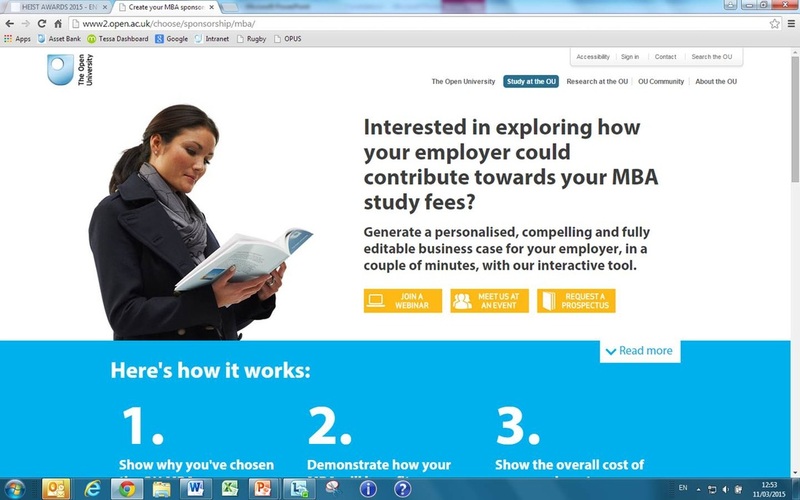 Through consultation with a range of academics from the business school and also their alumni, The Open University developed a mobile optimised online tool which helps generate a personalised, compelling, and fully editable business case document for presentation to a students future employer. Harper Adams University established a national competition aimed at 11-19 year olds with an engineering focus to promote engineering as a possible future career path. The competition was designed to be of interest to young people interested in art, IT, maths, science, design and technology – all subject areas which are valuable in terms of a future in engineering. In April 2013, The Sunday Times published a series of allegations about how animal research was carried out at Imperial College London. The allegations came about as a result of an infiltration by a member of the animal rights organisation BUAV (British Union for the Abolition of Vivisection) who worked undercover at the College for several months. This campaign encompasses the steps the College has taken since to investigate and respond to the allegations and the strategies it has developed to engage with its key constituencies. Nottingham Business School’s Thinkubator Challenge® was a ground-breaking one- day event offering businesses free advice. On 19 November 2014 students and academics provided responses to 60 business problems. Informed by the School’s research highlighting that SMEs are actively looking to engage with HEIs, the Thinkubator Challenge® facilitated this engagement. From developing new treatments to informing government policy, work conducted by Queen’s staff is changing lives. The Communications and External Affairs Office were asked by Senior Management to develop an internal communications campaign aimed at staff to raise awareness of the life-changing work conducted at Queen’s and highlight the contribution of all staff to Queen’s success, creating a sense of pride. The Lancashire Science Festival (LSF), designed and delivered by the University of Central Lancashire (UCLan), was launched in 2012 as a free interactive event, bringing science practitioners together, enabling school children, their families, and the wider community to see first-hand the breath of science-related expertise and its real-world applications. Teesside University is committed to encouraging and supporting under-represented groups to progress in education. As part of their Corporate Social Responsibility approach, the University has slowly built relations with refugee and asylum seeker groups, and with professionals supporting them. Leeds College of Music developed an Online Responsive Brochure (ORB) as a means to present their prospectus on the web in a way that makes full use of the digital environment. LCoM wanted something to fill the usability void between their printed prospectus and website, giving the user a fully immersive and multi-sensory experience that allows them to really feel what it’s like to study at the college. Queen’s University Belfast is one of the UK’s top ten research-intensive universities. They wanted to raise the profile of the impact of their research and illustrate how it is changing people’s lives every day. The University was named a Movember Centre of Excellence in 2014 for its research so the University wanted to promote Movember and raise money for the charity which funds life-changing research at Queen’s. #TestDriveDundee is an innovative take on the traditional student recruitment advertising campaign, harnessing the power of social media and peer review with the objective of raising the profile of the University of Dundee in key target rest of UK regions. #TestDriveDundee had a key place in the University’s strategy to increase the number of entrant undergraduate students in non-controlled subjects from the rest of UK regions. Leeds Beckett University needed to create a website based on clear and extensive insight, both in terms of content and navigation. The launch of the website formed part of the digital marketing strategy which aims to place Leeds Beckett at the forefront of digital communications. Imperial College London launched a new web design in December 2014; its first institutional redesign in seven years. 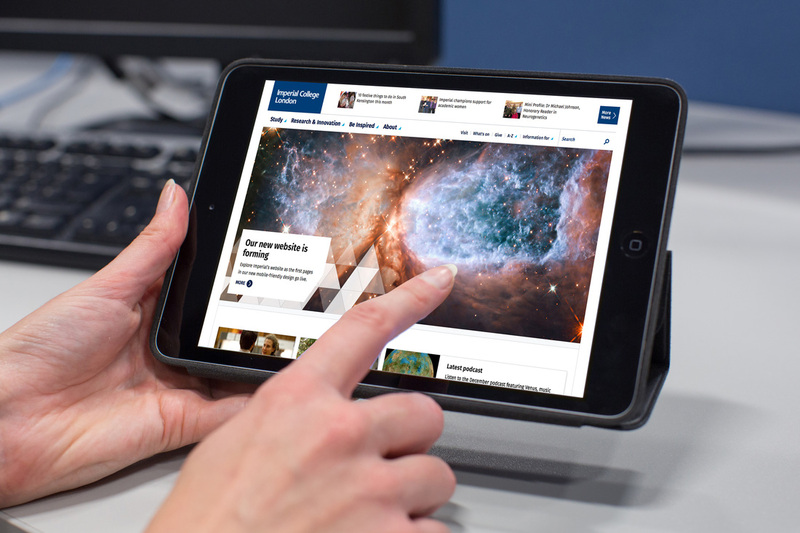 As a leading institution specialising in science and technology and ranked in the world top ten, it was important for Imperial to have a web presence that matches its quality and demonstrates the reach and impact of its work and the wonder of science. This project was initially set up to deliver a ‘mini’ brand for the recruitment of senior academics. At the point that the employer value proposition was developed, it became clear for the University that the strength of ‘Pursue the extraordinary’ could work far beyond that sphere of recruitment and had the potential to become the employer brand for all recruitment related communications. As part of the University of Manchester’s strategic vision of becoming a top 25 global research university by 2020, an international recruitment campaign was designated to support this target. The World Leading Minds concept was implemented on a responsive microsite featuring Professor Brian Cox of the School of Physics and Astronomy. The key message was simple: a worldwide search for excellence. Run during International Random Acts of Kindness Week, this campaign aimed to increase brand awareness by reaching a large number of people. The University engaged current students as brand ambassadors and filmed a series of videos showing ‘Random Acts of Kindness’ which were released once a day on social media. Acting on market research into the undergraduate and postgraduate customer journeys, Leeds Beckett University felt there was a lack of information from the point of offer accepted to enrolment. The ‘100 Day Fresher Countdown’ campaign was a series of images produced to advise new students on a unique activity they could do on each of the 100 days leading up to Fresher’s Week. The Student Voice Award, in association with our sponsor The Student Room, has been surveying students to understand whether they believe the marketing they saw before they joined their University has proven to be realistic. We have been overwhelmed by the response, with over 5,000 votes cast in the first year of this award. At 12.27pm on 23rd May 2014 the most significant, catastrophic and disruptive event to ever happen at The Glasgow School of Art occurred – a fire broke out in the GSA’s icon, architecturally significant and internationally heralded Mackintosh Building, home to some of the finest painting studios in the world. The Marketing Department have worked tirelessly to ensure brand reputation during the period of disruption since the fire. The team at Loughborough University have rapidly built up momentum and significant sector impact through a range of interesting and quirky initiatives, all laser-focused on impact and strategic delivery.